Diagram that shows the relationships between the early Indian/Buddhist Stupa and what would become the Japanese and Chinese Pagodas. Although it began to harness agriculture later than Middle Eastern and Meso-American tribes, Chinese culture had developed continuously and largely uninterrupted by western influence for over 4000 years. The first religions in China were carry overs from Indian Buddhism and Hindi. By the 5th century BC the teachings of Confucius and Daoism by the oracle Laotzu were infused into Chinese philosophy. Confucianism taught an ideology that focused on respect for authority and elders as defined by the state and the subjection of common folk to the wisdom of rulers and leaders. This philosophy has dominated the development of Chinese politics throughout its history and has had a direct influence on Chinese architecture and urban planning. By contrast, Daoism, is a mystical philosophy that teaches humans to seek harmony and balance by embracing nature. It's a completely non-rational and non-authoritative train of thought. These philosophies are polar opposites but each has had a profound effect on the built environment. The Stupa - an Indian invention - influenced the Chinese Pagoda building type, and by proxy the Japanese. 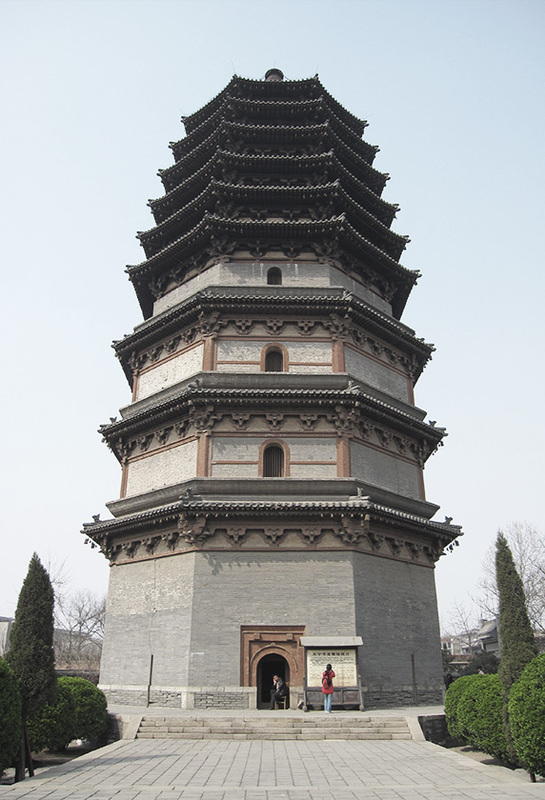 The pagoda is essentially the skyscraper version of a stupa. It is distinguished by its vertical tiers of cornices and curved roof & eave lines. Like stupas, pagodas were used as temples and houses for relics but were also used as folly objects in Daoist inspired garden designs. Befittingly, Confucian philosophy comes to light more in city planning and imperial architecture. Chinese cities were laid out on grids within a large square surrounded by a fortification wall. The imperial area of the city was placed at the center and could only be reached by passing through successive massive walled gates which would certainly have a very imposing impression on visitors. Alignment with the cardinal directions (N-S,E-W) was paramount. The largest and most important buildings were aligned on the North-South axis and were framed by the openings of massive gate entrances so that the granduer of these imperial buildings would be the first thing one would see. This method of urban and architectural planning enforced the Confucian ideals of strong hierarchy, submission and subjection. The most famous example of this design thought is the Forbidden City in Beijing, the Chinese capital city. Looking south from the Imperial Gardens toward the Forbidden City. Notice how the entire complex is organized around a strong major axis and locates all of the larger main buildings. This planning philosophy is a direct motive from Confucian ideals and rigor. Traditional Japanese civilization began independently, but its culture and architecture is a mix of Japanese, Chinese and Korean ideas. One major distinction is in the religious origins. Japan’s native religion is Shinto, a set of principles that hold in high regard the natural forces that agriculture is dependent on like rain, sun and the moon. It is similar to Daosim and Hindi in this way. Over the centuries this ideology was colored with the teachings in Chinese Buddhism and eventually would alter Japanese architecture. For instance, the Japanese also utilize the pagoda building type and rely heavily on the internal courtyard for residential buildings and imperial palaces. Their are some uniquely Japanese traits though. The roofs of Japanese pagodas tend to be more exaggerated and elongated making the towers seem more horizontal than vertical. Japanese city planning has a more unbalanced and asymmetrical organization than Chinese cities (although symmetry was still a dominant theme) and tends to be smaller in scale. Shinto religious shrines, are more reminiscent of the gable roofed temples of European culture than the Stupas of India. Japanese Shinto shrines and residential buildings show more expressive and elaborate detail in their wood structures than their Chinese counterparts. Peculiar to the Japanese house is its flexible spatial organization which made possible an internal openness of space. This free and flexible method of organizing space is one of the precedents for the modernist design philosophy of the 20th century and had a particularly heavy influence on the American architect, Frank Lloyd Wright.